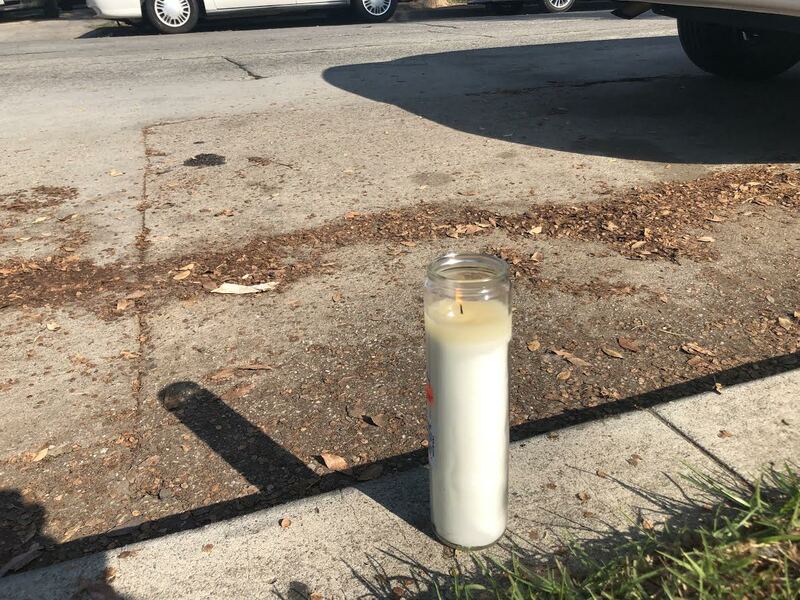 A candle placed near the scene of a shooting that killed Sandra Coleman and Don Sims in Central Long Beach on Saturday, Nov. 17, 2018. Photo by Stephanie Rivera. A section of a Central Long Beach residential street where a couple was gunned down in their car Saturday evening left small clues Sunday morning to what was a grim scene only hours before. 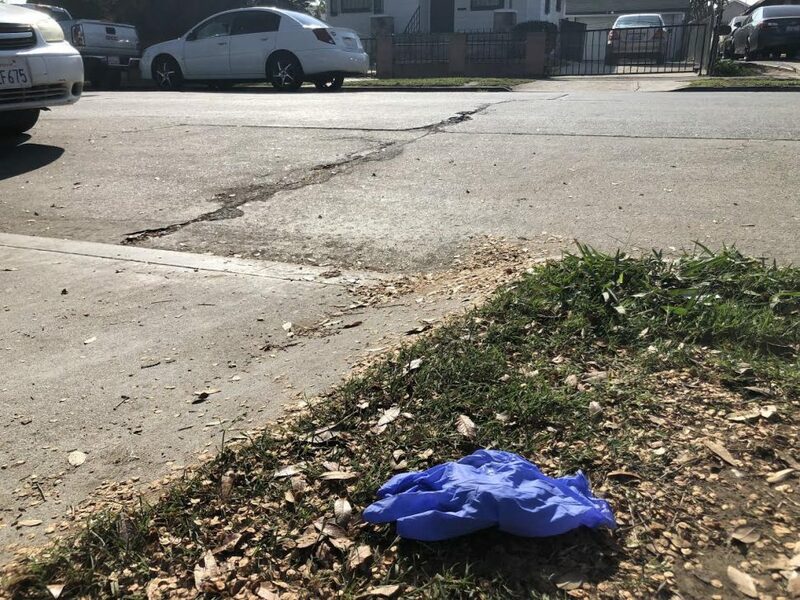 A lone blue medical glove on a patch of sidewalk grass on one side of the street and a white lit candle on the other side, along with a water stained section of the street that neighbors said may have washed away the victims’ blood stains, were all that remained. A medical glove left the day after the scene of a shooting in Central Long Beach Saturday, Nov. 17, 2018 that killed local residents Sandra Coleman and Don Sims. Photo by Stephanie Rivera. “It was pretty bad,” said resident Shawn Williams, who heard the nearby gunshots and saw the commotion that ensued. Williams said he heard what sounded like 50 rounds go off when he was standing at a nearby gate. Soon after, he saw paramedics rush to the scene and treat the pair in the street. “I heard the shots so I ran into the house to make sure my kids were all right and everything and I came back out and I seen the car shot up,” Williams said. Harry Tan, who works at a liquor store around the corner, said he heard about 20 gunshots. “I didn’t rush out, just closed the door, and the neighbor just told me stay inside,” Tan said. Detectives later stopped by to look at footage from his store’s security camera. Tan said while it’s his first time witnessing an event like this, it is not uncommon in the area and it isn’t the first time he’s offered security footage to police. “One time there was two ladies who come here and the next day one of them died, like a homicide, so the detective was here looking at the camera,” Tan said. There have been at least two other recent fatal shootings on that block, according to Williams, including the 2016 murder of a 19-year-old father. Police said Long Beach residents Sandra Coleman, 56, and Don Sims, 55, were in a vehicle in the middle of the road near 17th Street and Alamitos Avenue when they were fatally shot by unknown assailants. Coleman died at the scene while Sims was pronounced dead at a local hospital. The motive for the shooting is still under investigation but authorities are investigating it as gang-related. Some residents believe there were three suspects, two men and a woman. Williams was told one of the men was shooting at the victims’ car as he chased it down the street. Sims recently got out of jail, said Williams, remembering him as always driving through the neighborhood in his lowrider truck. Williams said the couple were married and that Coleman was his mother’s friend. On social media, friends remembered Coleman, who was an employee at Walmart. The street is usually active with playing kids, said Williams. “Right there where it happened there’d be a lot of little kids playing so I’m glad no kids got shot up,” he said.